As you can see the basic earning is 2 points per dollar on hotel bookings, packages with a hotel, activities purchases and some car rentals. For flights you only earn 1 point for every $5. If you happen to earn all your points at the 2 points per $1 rate then you'll be getting a return of 1.4% on that spending based on the C$25 voucher for 3,500 points. Of course if you add in gold, silver or +VIP bonuses that rate of return increases. One big caveat you have to remember though is that the majority of hotel bookings made via Expedia.ca do not earn points in frequent guest programs like Hyatt Gold Passport, Starwood Preferred Guest and almost all other major hotel chains. As well the stays may not count toward elite status qualification but if you hold elite status you may or may not enjoy those elite benefits on your stay booked via Expedia.ca. If you count on hotel points and status this program may not make much sense to you but if you are price conscious and switch brands willy nilly or stay at hotels that don't have loyalty programs then the Expedia+ program can definitely make sense for you. Flights are a different story, as long as an airline is running some sort of bonus whereby you have to book via the airline itself you can definitely try to funnel your bookings via Expedia since you'll earn you frequent flyer miles and elite status qualification (as long as it is an eligible fare class) and you'll enjoy your elite status benefits if your are a member of that airline or airline alliance program. To earn +silver status you have to spend C$5,000 on eligible bookings or stay 7 qualifying hotel room nights, and +gold status after spending C$10,000 on eligible bookings or staying 15 qualifying hotel room nights. +blue is the level everyone gets right when joining the program. 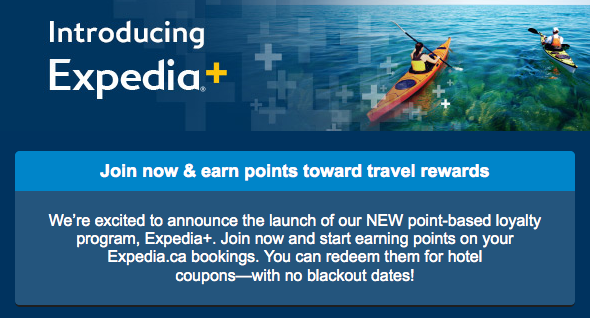 Overall it's finally nice to see Expedia Canada follow in the footsteps of their U.S. parent. Is this a great reward program? Not really. Is it a bad reward program? No, not that either. If you use Expedia.ca semi-frequently then it can be a nice fit for you but if it is a site you only once a year it may not be worthwhile to join the program. The rewards aren't huge but if you spend enough and get that 1.4% return coupled with any rewards you earn on your credit card for those bookings this program can definitely fit nicely into your reward program portfolio. To find out more or the join the program click here.